In the span of a week, NY temperatures have gone from 90 degrees F a day to 55. I feel like I am always surprised, nay shocked, by Fall, and this year was no exception. In any case, with the drop of the temperature, it seemed that it was appropriate to begin the season of making chili, pumpkin recipes and all else “Fall”. While flipping through an old Mark Bittman book that I have loved for years, I came across a Pumpkin “Crème Brûlée” — left in quotes since it’s not truly a custard but it is as delicious as Mr. Bittman says in any case! 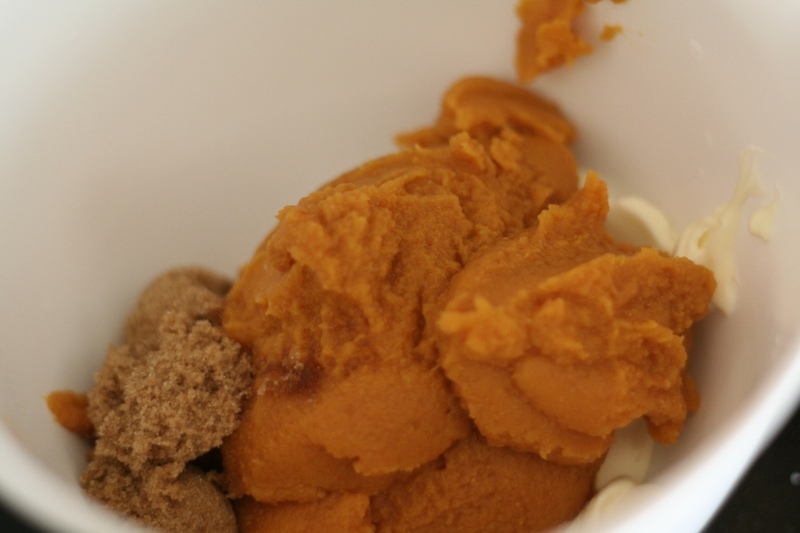 Whisk the mascarpone, pumpkin puree and brown sugar together in a bowl until combined. Add cinnamon, allspice and salt and whisk. Pour into 6 oz ramekins. When ready to serve, sprinkle brown sugar in a thin layer on the mixture in the ramekins. Set the oven to broil. Stick the custard cups under the broiler for 5 minutes.